Fourteen different representatives from different types of employment attended the ‘Next Step ‘day at Savio. Every Year 11 student attended workshops on Apprenticeships and were guided through the process of registering on the Apprenticeship website, as well as learning about the different type of apprenticeships delivered by Jan Agger from GMLPF. They were then put through their CV paces by Valerie Jones (The Work Outfit) in a CV Bootcamp with information and guidance shared on how to compile a CV and how best to present yourself in the workplace. 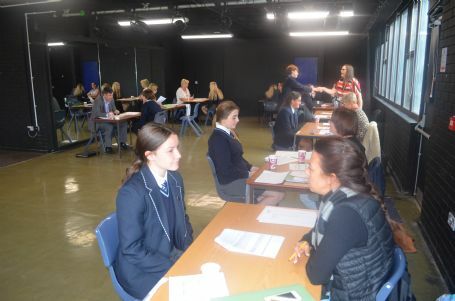 Finally every student was interviewed and feedback provided on their application form and interview performance. These students should now be prepared for the ‘Next Step’ in their lives ready for job / college interviews and how the process works.